In the course of your life as a homeowner, there are going to be many occasions in which you need to apply caulk in or around your home. While there are several types and variations of caulk, as well as several applications, the basic method of caulk application remains much the same. Caulk is a flexible substance made up of latex, acrylic, polyurethane, silicone or a combination of any of these. It is used to fill joints, gaps and cracks in and around your home. Caulk serves as both a barrier, keeping moisture from entering these gaps, and as an absorber; it can flex and absorb movement in your home. Caulk can last anywhere from a few years to as many as 50, depending on what it is made of, and where it is installed. Over time, caulk can discolor, dry out and crack, which can leave your home open to moisture damage. If you have caulk that is missing or cracked, you will need to remove the old caulk before you can replace it. Insert the utility knife into the caulk as close to the edges of the material it abuts as possible. Cut in straight lines on either side of the joint. For example, if the caulk is between a tub and some tile, cut next to the tub and next to the tile as close as possible without scratching the tub or tile. Use the edge of the knife to pull up the edge of the caulk. If it is flexible, pull it up with your fingers. If it is dried out, use the knife to pry the dried pieces free. Wash out the joint and inspect for signs of mold or mildew. If either is present, apply a mold or mildew killer. Allow the joint to dry out for 24 hours before applying the new caulk. Nearly all caulk comes in a tube that can be fitted into a caulking gun. Caulk guns are fairly inexpensive and last for years; invest in one to make your job go easier and to have on hand the next time you need to replace the caulk in your home. Slice a small section of the tip of the caulk tube off with the knife. You can always increase the size of the hole in the tube if needed later; start the hole off small to avoid flooding your gap with too much caulk. Fit the tube of caulk into the gun. Press the tip through the holder and place the plunger against the back of the tube. Tighten it down until you can squeeze the trigger lightly and receive caulk from the open end. Squeeze a thin line of caulk into the gap from one end to the next. Aim for the center of the gap as much as possible, but don't try to push the caulk in too deep. Wet your index finger in water and use it to smooth the caulk out. Press the edges of the caulk against the sides of the area you are caulking. Rewet your finger frequently and continue smoothing the caulk until you get a smooth, even joint. Make it a yearly habit to inspect the caulk inside and outside of your home. 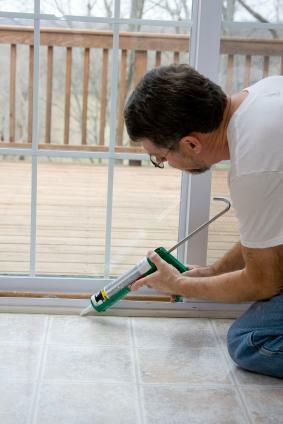 Replacing caulk is a quick and simple job; take care of it as soon as possible to keep your home in good condition.